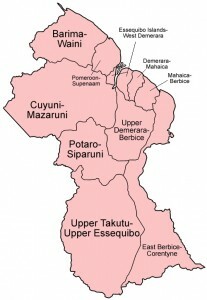 An internationally recognised map of Guyana that includes Essequibo. Venezuela has announced that it will be going to the International Court of Justice (ICJ) in The Hague, Netherlands, along with representatives of Guyana regarding the border controversy over the Essequibo region of Guyana, over which Venezuela claims sovereignty. “The Government of the Bolivarian Republic of Venezuela, faithful to its historical position and in accordance with Bolivarian Peace Diplomacy, reiterates its firm willingness to defend the territorial integrity of our country based on the 1966 Geneva Agreement, the legal framework that governs the territorial dispute of Essequibo,” Venezuela’s Foreign Ministry said in a statement. Venezuela’s decision to participate in the ICJ came three months after the United Nations (UN) Secretary General, Antonio Gutteres announced his decision to refer the controversy to the ICJ after intensified mediation during 2017 failed to bring about a resolution. Guyana has since instituted proceedings to the ICJ. Caracas’ move appears to be a major shift in its decades-old position that it wants to settle the controversy bilaterally through the UN Good Officer Process, a mechanism that Guyana said has failed to bring about a resolution for the past 50 years and it is time for a judicial settlement. It is unclear whether Venezuela will at the ICJ procedural hearing stick to its interpretation that the 1966 Geneva Agreement provides only for a bilateral settlement of the controversy instead of a judicial one at the ICJ. The Venezuelan government says that it will act through all legal and diplomatic means to resolve the controversy over whether the 1899 Arbitral Tribunal Award is null and void or, as Guyana maintains, a full, final and perfect settlement of the land boundary between the two South American nations. Venezuela has claimed the region part of its territory for hundreds of years, but an agreement signed by the United Kingdom in 1966, which was Guyana’s then-colonizer, granted authority of the area to Guyana. Upon receiving independence, Guyana continued to claim the region, sparking a diplomatic conflict over the territory. The controversy flared up when Exxon Mobil Co. found massive oil reserves offshore Guyana in 2015, causing President Nicolas Maduro to unilaterally extend his country’s maritime boundary to include the Liza well which is located off Demerara instead of Essequibo. Through the 15-nation Caribbean Community, Guyana got Venezuela to withdraw its maritime boundary line. Over the years, Venezuela has sought to obstruct Guyana’s exploration and production of natural resources including oil and gold.